In April 2009, Donald Trump's predecessor in the Oval Office, President Barack Obama, made his own trip to Iraq to visit US military personnel. The contrast between the two trips is sometimes stark - not just because of the timing, but also because of the very different tone they put on display. This itself is a reflection of the different personalities of the two men as commanders in chief, as well as the dramatic changes that have taken place in the Middle East in the past nine years. Like Obama's visit, Trump's trip to Iraq was not announced publicly beforehand - a reflection of the security concerns that have not abated much between 2009 and now. Both visited American troops in the country, with Obama meeting them inside a palace built by Saddam Hussein in Baghdad, while Trump visited an air base. Neither president spent more than a few hours inside Iraq. Certainly, the Iraq that Trump is visiting is in a very different neighborhood than the one that Obama visited in 2009. In 2009, there were no U.S. troops in Syria to withdraw - indeed, that country had not yet started on the path of the civil war that has killed over half a million people since 2011. Obama himself had not yet helped reach the nuclear deal between Iraq's neighbor Iran and other world powers in 2015, while Saudi Arabia had not begun the complicated series of changes that were kicked off by King Abdullah's death in 2015. 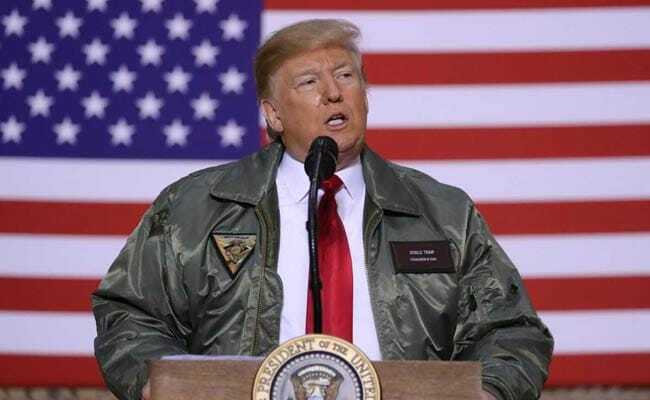 But as he visited Iraq on Wednesday, Trump had a very different message - again, a real contrast to Obama's message nine years before - to the roughly 5,200 U.S. troops currently deployed in Iraq. The message was that this time, there was no immediate plan to withdraw American soldiers from Iraq. "In fact, we could use this as the base if we wanted to do something in Syria," the American leader added.